USC's offense was dealt a limited game plan with limited numbers, so head coach Steve Sarkisian is hardly concerned about a less than stellar offensive performance on Saturday. 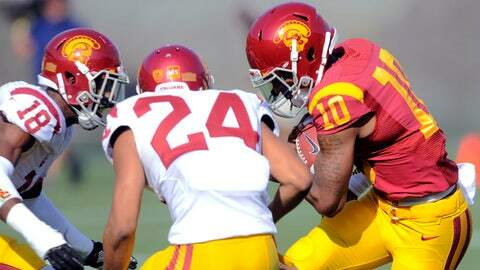 LOS ANGELES — Members of the USC offense can’t say they didn’t have their chances during Saturday’s Spring Game at the Coliseum. On the first drive of the game, the first team offense led by quarterback Cody Kessler got down to the one-yard line. But the door was slammed shut by the defense and linebacker Hayes Pullard, who stopped a third-and-goal run play in its tracks. As it turns out, he had the inside track. According to Kessler, Pullard knew the play. "He’s a veteran, though," Kessler said of Pullard. "You expect that from an All-American linebacker." The USC offense wouldn’t get any closer to the endzone the rest of the afternoon as Saturday played out as one denial in the redzone after another as the White defeated the Cardinal 19-15 in front of an estimated 20,000. (The White is the USC defense, while the Cardinal team is the USC offense). It was far from a banner day that showed little of the big play capability or efficiency the offense displayed through the first 14 practices of the spring. Of course, the offense was dealt a limited game plan with limited numbers. 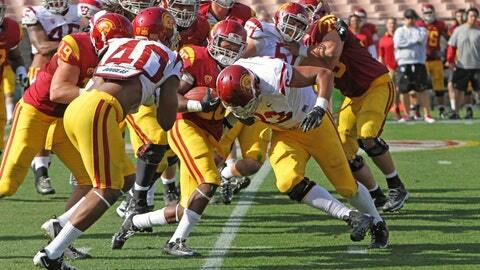 Leading tailbacks Tre Madden and Buck Allen played sparingly. Somewhat shorthanded, USC’s offense failed to get into the endzone all day with the bulk of their scoring– minus the one point they received on selected first downs– coming off of the foot of kicker Andre Heidari. The USC kicker made 4-of-5 field goals, with a long of 44 yards. As far as those red zone struggles go, head coach Steve Sarkisian isn’t too concerned. "It’s spring practice, (the) Spring Game," Sarkisian said. "We’ll be a great redzone offense. Historically we’ve been and wherever I’ve gone we’ve been really good in the redzone. Obviously, this was a bit of a vanilla gameplan. We just wanted to let the guys go play regardless if you’re a one, two, or three on the depth chart just to know what to do and go play. "They had a couple of chances and weren’t able to convert. It’s good that we played good redzone defense. I’ll look at it that way."